Explore the Borderlands during a thrilling evening with renowned author Gary Paul Nabhan and discover why food tastes better when we know the science, history and culture behind it. Join us for an evening of discovering how history influences the taste of the food we consume. Nabhan, the Kellogg Endowed Chair in Sustainable Food Systems at the University of Arizona, will share excerpts and stories from his book Desert Terroir, in which he delves into the ecological, cultural, and personal history of the food we grow and eat. The terroir, or “taste of the place,” of the U.S.-Mexico Borderlands is rich and unique, and Nabhan will leave you craving a taste of the desert. SUU Convocations is proud to present the internationally-celebrated, award winning, agrarian activist, Gary Nabhan. Nabhan will be discussing the root of his work with heritage food, that has been essential to mankind’s growth through-out time. The lecture will take place on February 16 at 11:30 AM. Nabhan’s lecture is being held in the Gilbert Great Hall in the Hunter Conference Center on Southern Utah University’s beautiful campus. As is the case with all of the SUU Convocation Series, this event is free and open to the public. Gary Paul Nabhan is currently the W.K. Kellogg Endowed Chair in Sustainable Food Systems in University of Arizona’s Southwest Center. In his work, he has been a pioneer in bringing together people of different crafts; farmers, ranchers, urban food activists, and indigenous communities to help sustain a variety of food-producing landscapes. Nabhan is also the author of thirty-four books, many being translated into a handful of languages. His work as an author has won him awards such as: a Lanon Literary Fellowship, the John Burroughs Medal for nature writing, and more. From Gary Nabhan’s work several varieties and breeds of food sources, that were previously thought to be extinct, are now coming back into the light through the effort of thousands of small farms across the country. Nabhan will be discussing the relationship of some of these specimens with the cultures that they once fed, the lands that they are able to grow, and how it can be beneficial to enjoy food specific to an area. Nabhan’s research and work has taken him across the country and across the ocean. Studying foods specific to New England, California, the Great Lakes Region, on the Gulf Coast, and many others. The vast knowledge he has discovered about these delectable food sources has been a life-changer for him, local farmers everywhere, and those that want to enjoy simply pure food. "I am so excited to be embarking on this new adventure with my production team! With a great staff and such energetic student workers, we are thrilled for the opportunity to take this landmark lecture series that we have here at SUU to the next level! We are so lucky to have this kind of series at SUU, and with such a skilled team we can really share these great guests with the campus and community." Gary Nabhan is the W.K. Kellogg Endowed Chair in Sustainable Food Systems at the University of Arizona, as well as the permaculture designer and orchard-keeper of Almuniya de los Zopilotes Experimental Farm in Patagonia, Arizona. Widely acknowledged as a pioneer in the local-food movement and grassroots seed conservation, Nabhan was honored by Utne Reader in 2011 as one of twelve people making the world a better place to live. A recipient of a MacArthur Genius Award, his twenty-six books have been translated into six languages. They include, "The Desert Smells Like Rain;" Cumin, Camels, and Caravans: A Spice Odyssey;" Ethnobiology for the Future: Linking Cultural and Ecological Diversity;" Growing Food in a Hotter, Drier Land;" Where Our Food Comes From;" Enduring Seeds: Native American Agriculture and Wild Plant Conservation." McArthur Award Winners discuss the creative process. Join us to welcome Gary Nabhan to UW for a lecture centered on the re-emerging importance of ethnobiology as a way to spur biological and conservation and cultural survival in the Anthropocene. Gary's full visit is sponsored by UW Program on the Environment, UW Geography, UW Quaternary Research Center, UW Anthropology, UW Farm, Nisqually Tribe, and Grub. 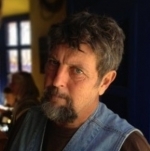 Gary is a renowned nature writer, agrarian activist and ethnobiologist whose work emphasizes the important links and synergies between biodiversity and cultural diversity. Gary’s work focuses on the plants and cultures of the desert and he’s also known as a pioneer in the local food movement for his work on bringing food diversity back to cities, in part by celebrating traditional ecological knowledge. Through his work, Gary has brought together farmers, urban food activists and indigenous communities to conserve landscapes and traditional livelihoods.